Home » » Fishermen are abandoned writing off their loan..
Fishermen are abandoned writing off their loan..
Fishermen are abandoned by writing off loans and interest of Fishery Co-operative Societies in Sri Lanka. This is how the present government and its governance are going to build up the fisheries industry in the country. 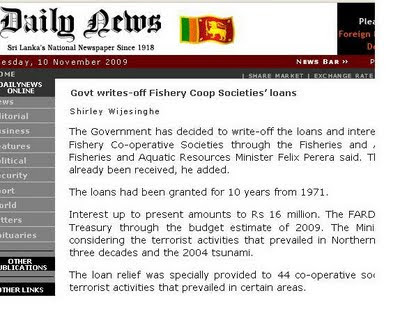 Here we can see our minister of Fisheries had added on Daily News today saying that these loans were provided for Fishery Co-operative Societies considering prevailed terrorist activities and the tsunami 2004 ‘ that’s all right but he doesn’t know the prevailing burning issues of fishermen all around the country specially in the eastern province. There is no such a big different in the eastern province after ending terrorist activities, in some places fishermen are still allowed for fishing according to some certain time period only in the sea. And because of the illegal fishing of big boat owners ‘some other fishermen are in a difficult position to catch even enough fish to survive. Though this is the prevailing condition of fisheries industry, the administration has decided to write off fishermen’s loans. As National Fisheries Solidarity Movement’ We really condemn this decision has been taken against innocent fishermen in the county and we line up them all fishermen who should fight for their rights against this injustice.